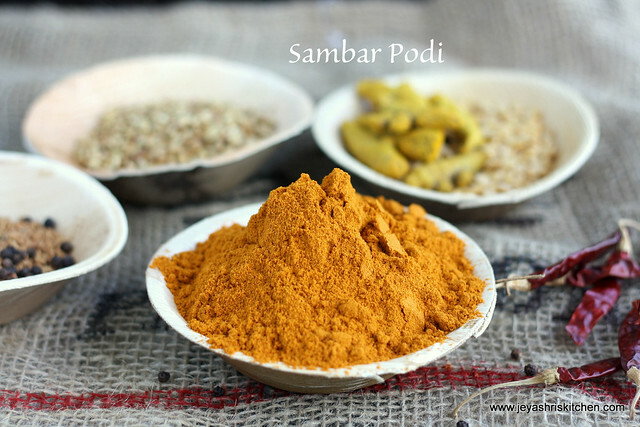 Sambar powder|Sambar podi is generally made at our place in bulk by drying it under sun and grinding it in the mills where they grind the ingredients of sambar powder into a fine powder. When i posted the recipe of Rasam Powder , i got many mails to post the recipe for sambar powder. I use sambar powder in most of my recipes and i love the one which my mom makes in bulk and pack for me during our visit to India. She is very particular to use the best quality of the ingredients as it will give a nice flavor to the sambar. *We use the long variety turmeric for this(Varali majal). Dry all the ingredients separately in a wide plate or on a newspaper in hot sun for 6-7 hours. If you didn’t get proper sun during rainy days, u can microwave the ingredients for few minutes without changing the color of the ingredients. Give it to a mill (rice mill) and make it into a fine powder. Once done , spread the Sambar powder in a wide plate in shade (inside the house) for 10 minutes and store them in a dry, clean container. Always handle this with a dry spoon. You can keep this in the refrigerator for longer use. This is the usual procedure in which we make sambar method at our place. 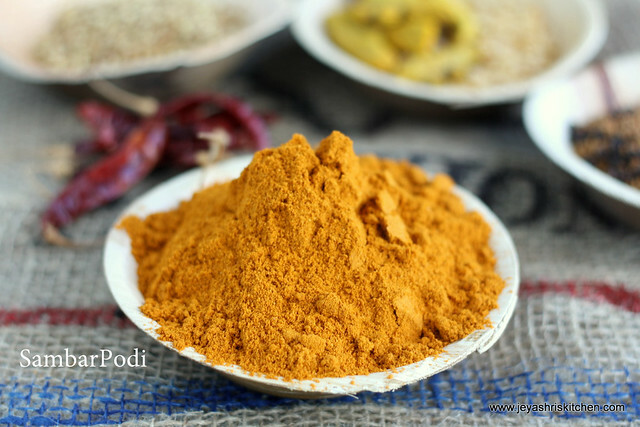 I do quite often, nothing will beat this homemade sambar powder. this is a very useful post, thanks fr sharing. I love this kind of authentic traditional way of cooking. Nice basic post and I like the clicks.. I also get a year'sstock when coming back from India..so convenient...lovely click..
can i make small quantity at home.is it imp to dry all the ingredients in the sun?can i use round red chilli?thanks. it s necessary to use long variety of red chilli? ur recipe s super waiting for ur next recipe.nice clicks....it looks perfect. Nothing can beat the taste and aroma and flavor of the homemade sambar powder!!! Can you tell me what all food/recipes in which I can use sambar powder apart from making sambar? Hi Jeyashri! U really have an amazing food site here that novices like me could make a great use of your knowledge. Thank you for that to start with. I am tired of using store bought sambar powders and your recipe is so tempting to try it at home for the 1st time and I am so excited abt it. The only problem i have is your measurements. Do you mind to share with me the measurements in CUPS please????? I really appreciate that. I hope it is not too much to ask. Thank you in advance! Hi jeyashri. 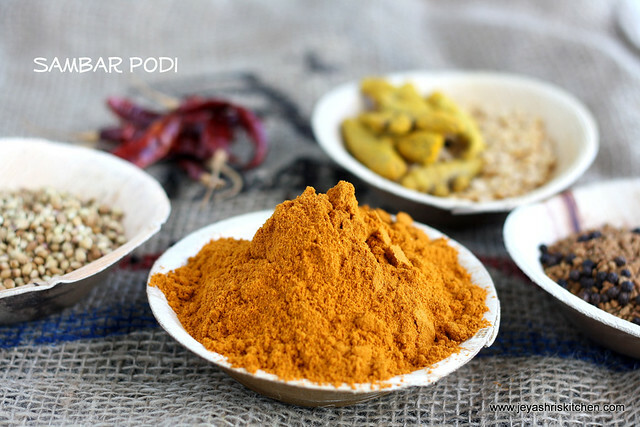 I learnt making sambar powder by reading to ur blog. Hope will make it well. Hi jeyshri... for a trial, can you give quantities of ingredients say for just for a week?? Hi Jeyashri, thank you for posting this recipe. Is there a "smaller proportions" version of this Sambar powder recipe so that it can be consumed in shorter period (making sambar 4 or 5 times for a family of 4). I tried estimating it but failed. Thank you. This query has been asked by many readers, will try to post soon. Hi jeyashri, you are a modern day Meenakshi ammal. We can very well refer your site to our children after marriage. Can u post a smaller proportion if this powder may be requirement for 1cup to or dal. Working on it. will post soon. Meanwhile you can try MTR rasam podi for making sambar. It is posted now, i have given the link in this post too. Please check. Thank you.